Of the several processes for removing mercury from the emissions of coal-fired power stations, the most preferred are those that have synergy with existing air pollution control equipment. Mercury is a potentially deadly neurotoxin. Mercury emissions from coal-fired power stations are a major environmental concern due to the toxicity and persistence of mercury that accumulates in our waterways. 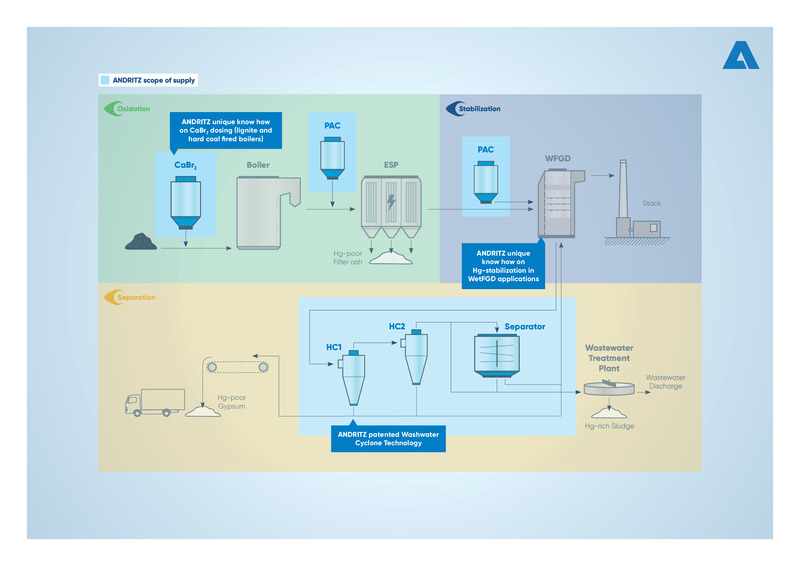 ANDRITZ follows a holistic approach by taking not only the various oxidation reactions in the flue gas pathway into account, but also the processes within the wet FGD system and downward streams. We expect that this issue will become a major topic worldwide for coal-fired boilers within the next few years. If the conventional oxidation in the gas phase, based on the gas condition and process set-up, is not sufficient to meet the emission limits, ANDRITZ offers a well-proven calcium bromide oxidation system. Dosing calcium bromide into the boiler is an adequate and easy way to oxidize the greater part of the mercury originating inside the boiler. Other process steps within the flue gas path are crucial for any further mercury oxidation downstream of the boiler as well. For instance, any enhanced oxidation within an existing SCR unit has to be considered for any process developments. Finally, the oxidized mercury will be captured at the FGD scrubber. ANDRITZ considers all the important process steps and the gas composition in order to optimize the mercury emission control system implemented. ANDRITZ is also looking into the documented topic of potential corrosion effects in combination with the bromine-induced mercury oxidation. Corrosion effects have been documented in some plants, especially in the USA. It was found that corrosion will occur primarily at the cold part of the cold side of the air heater in cases where unusually high bromine concentrations were added to the coal mill and the process set-up was not favorable. Bromine is not unusual in flue gas. It is found in any coal containing halogens. 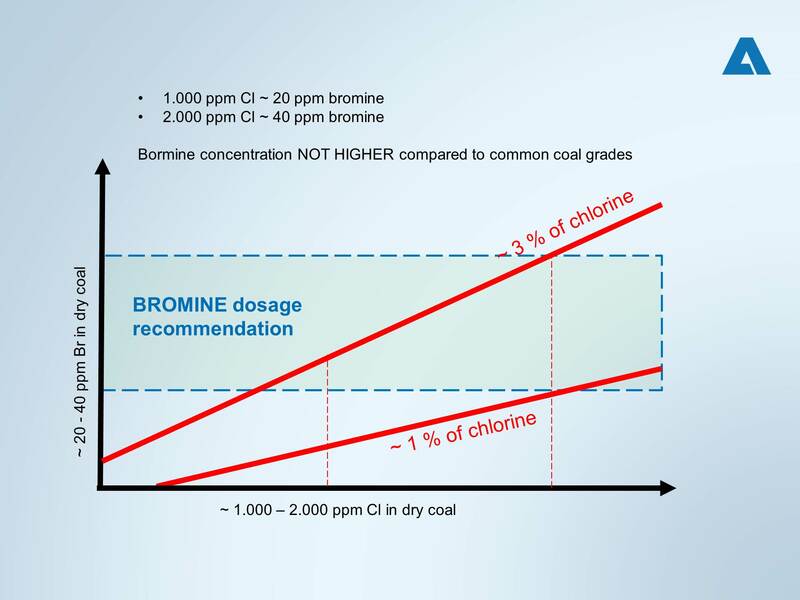 In general, the bromine content in coal will be roughly 1 to 3 % of the chlorine content. With a chlorine content of between 1000 and 2000 ppm in the dry coal, this means that the bromine content in the same coal will be between 20 and 40ppm. This is also the effective operating range that ANDRITZ recommends for any additional bromine dosage to the coal. Thus, corrosion effects as a result of additional bromine being added can be excluded. The wet FGD is not only a very efficient way of separating acidic components from the flue gas stream, it is also highly efficient when it comes to removal of the oxidized mercury species. However, inconsistencies in wet scrubber chemistry can be linked to re-emissions of mercury that has already been captured. In order to avoid any re-emissions from the FGD process, ANDRITZ focuses particularly on binding and stabilizing the dissolved mercury in the limestone slurry. If, for instance, PAC (powdered activated carbon) injection is applied to inhibit re-emission, the main mercury sink in the conventional process chain will be the FGD by-product – the gypsum. This is unacceptable for two major reasons if the plant management is targeting beneficial use of the FGD product. Firstly, it greatly increases the mercury content in the gypsum, which could render the FGD product useless as a resource for the drywall industry. Secondly, the gypsum whiteness will deteriorate and hence be unattractive for commercial use. With conventional hydrocyclone systems, the specifically bound mercury cannot be removed efficiently from the gypsum. Thus, ANDRITZ offers a patented hydrocyclone design that clearly separates the mercury-loaded particles (e.g. PAC) from the gypsum and thereby reduces the mercury content in the FGD product to a minimum. This patented wash water hydrocyclone technology is easy to implement and has a clear advantage for any upgrade of existing FGD installations for any upgrade of existing FGC installations in order to enhance mercury transfer to the waste water treatment plant and also to prevent an increase in the mercury concentration within the scrubber. ANDRITZ offers an upgrade of any mercury reduction system with a clear mercury sink within the FGD system and can draw on long-term experience with any dewatering technology. Thus, a controlled mercury sink is created.